Paul’s new book, Loose Units, is available NOW! We chat about the rigors of churning out a book, especially one as gritty and challenging as this one. For our overseas listeners, you can – and should – pick a copy up on Amazon, or in all good bookstores! We talk with Darren P. Williams, Senior Software and gameplay engineerand Dusty Nolting, Lead Character Artiston World of Warcraft! 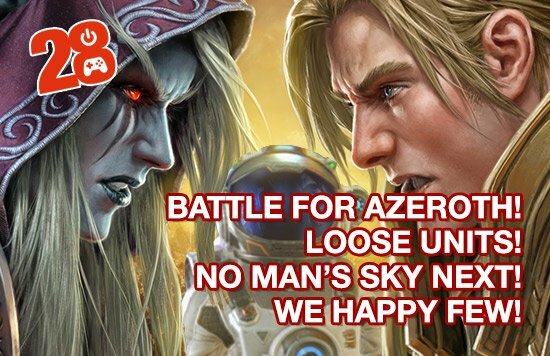 Battle for Azeroth, the new expansion, hits today and we asked them the hard hitting (read: stupid) questions! We talk Kris’ innante urge to cheat on the super No Man’s Sky: Next! Gasp as Paul takes him to task! Shudder as Kris kind of straight up admits he has a problem! Will he get the help he needs?